Our view into a vast forest of old-growth–an appropriate place to discuss Fundrise! Before I could go any further Peter, one of my participants, jumped in saying that he had just joined Guerilla Development ‘s Burnside Bridgehead project investor network yesterday. He went on to say that what he had done was express an interest in investing a specific amount, rather than invest it, as the project was simply testing the waters right now. He also expressed the opinion that local investments from Portlanders will allow far more creativity to thrive in our local buildings than Wall Street banks would likely allow. He described Guerilla’s Dumbell project designed by Kevin Cavanaugh as two six-story mixed-use buildings, looking like they were covered in gift-wrap and connected by sky bridges–really imaginative, really Portland! Like Peter, I’m really excited about Fundrise’ launch in Portland! It seems that when I was writing my “Financing the Evolution of the Built Environment” blog a few years ago, Dan and Ben Miller were on the other side of the country–in my hometown of Washington, DC–actually creating the vehicle that could make possible the return to local funding that I was writing about. Using the Fundrise model could mean that the passionately involved neighborhood activists that we see in Portland–and throughout the nation–could use their energy actually funding projects that they would like to see, rather than fighting projects they oppose. Combined with Portland’s local startup What Would You Like To See?, Fundrise really could become a vehicle to helping neighborhoods define what gets developed. According to the Oregon Daily Journal of Commerce, Fundrise “makes money as a subscription-based service and through commissions.” It takes care of what would otherwise be an immense amount of paperwork for a developer to pursue the SEC’s Regulation A route to seeking investment capital. Fundrise does not get us all the way there in financing the evolution of the built environment. In order to give our young planning and urban design graduates and our minority and women business enterprises—and all those underemployed planners’, urban designers, architects, etc.–a chance at fulfilling careers in built environment fields, we still need to press for many changes to the banking and investment systems at the federal level that I pointed out in my Part 1 article cialis no prescription. We also need to support the recommendations for federal policy change in the Congress for the New Urbanism’s Live/Work/Walk: Removing Obstacles to Investment Initiative and the Smart Growth America coalition’s Federal Involvement in Real Estate: A Call for Action. These recommendations could save the Federal government billions (hey Congress! )–while moving us towards more walkable and resilient neighborhoods. However, in an era of Congressional gridlock, Fundrise offers a tremendously important start–and HOPE! I lead trips for the Columbia Group Sierra Club focused on natural and cultural history and today’s environmental issues. This entry was posted in Community Investment, Financing, Fundrise, Real Estate, Sustainable Urbanism, Unemployment in Built Environment Professions, What's Next? and tagged civic engagement, community investment, Financing, Fundrise, real estate, Wall Street, What Would You Like to See on October 8, 2013 by Mary Vogel. A version of this blog first appeared in the Portland Business Journal shortly after the ULI What’s Next event on March 7, 2012. Walking over to the event at the Nines Hotel, I thought about what I hoped to learn. ULI is a national, even international, thought leader in the real estate industry. The advertised intent of the seminar was to examine how our region is postured to remain competitive in the 21st century. I had more short term goals. I wanted to know how ULI and local business leaders foresee the Portland region and the state getting out of the building slump (and consequent unemployment for planners, urban designers and other built environment professionals) we have been in since 2007. From an examination of name tags, the audience for this event were largely lawyers, a few planners and a few commercial real estate consultants. I didn’t see any developers that I recognized—albeit my recognition field is limited. I had been wondering when ULI would jump on the jobs bandwagon in a big way. This was the event! Both in her presentation and in the book, McAvey asked “Where the hell are the jobs?” (resisting her editors plea for more sedate wording). Even lawyers are outsourcing parts of their business as never expected. Social Security in 1945 each worker was supported by 42 workers, in 2009 just 3. Lumina Foundation found that young people in US do not have enough education to compete. Between now and 2018 Oregon is expected to create 59.000 jobs – but there will not be enough workers with post secondary education to fill those job needs. America is significantly de-funding its education. McAvey believes there are some bright spots. Business and professional sectors and education of all types as well as health care and medical have grown phenomenally. “America is still wildly entrepreneurial and leads in venture capital” she claims. This is partly due to the creative culture and substantial capital reserves. The Housing Outlook she presented was similar to what I have heard for the past few years: Apartment living is on the rise. Six million new renter households may be formed between 2008 and 2015, requiring 300,000 new units annually compared with just 100,000 produced in 2010. “But can the industry deliver that amount for the rents at which people looking to rent can afford?” she asked. Meanwhile, more single-family homes are being occupied by renters, changing the feel and politics of suburban communities. Seventy-five percent of households in Portland do NOT have children under 18; 47% are non-families, she said. Twenty-somethings on tight budgets prefer places to congregate with friends—in parks, bar scenes, restaurant clusters, and building common areas—and can tolerate smaller living spaces, McAvey claims. Sandra McDonough believes that we are hampered by tax policy, physical infrastructure and regulatory framework – a lot of it from the 70’s [referring to Oregon’s land use laws]. “We do not have enough sites for new industrial users,” she maintains. Although I spaced out during Eiland’s answer, she later told me that “Intel has now invested more than $20 billion in Oregon since 1974. We continue to invest and grow our manufacturing and R&D capacity here. The Hillsboro site remains Intel’s largest and most comprehensive site anywhere in the world.” I interpret that to mean don’t expect Intel to move into downtown Portland, or even downtown Hillsboro, anytime soon. I heard recently that Metro Council Members were cautioned not to talk about climate change. Governor Kitzhaber and Mayor Adams didn’t mention it in their recent State of the State/State of the City speeches at City Club either. It seems that ULI got that memo too. I was a bit baffled to attend an event on trends that made no mention—only guarded allusion to—the two big trend topics of the day in my world: climate change or growing income inequality! While ULI played up this event as being about a paradigm shift, their Oregon panel members gave only predictable answers that did not reflect much awareness of that shift–none of that Oregon leadership that we witnessed in the last century. It would seem that we are resting on our laurels rather than embracing the shift. 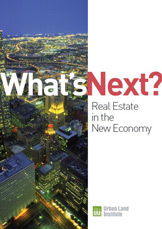 I left with more questions than answers—but eager to read the copy of “What’s Next? Real Estate in the New Economy” that ULI so generously provided to attendees. Mary Vogel is founder and principal of PlanGreen, consultants on walkable urbanism. She is a Board Member and Advocacy & Alliances Chair of the Congress for the New Urbanism Cascadia Chapter where she helps to shape climate change policy. She is also a member of the progressive business alliance, VOIS. This entry was posted in Climate Change, Economic Development, Gen Y, Housing Market, Real Estate, Sustainability, Trends, Unemployment in Built Environment Professions and tagged climate change, housing market trends, Intel, jobs, paradigm shift, Portl of Portland, Portland Business Alliance, Portland Business Journal, Portland State University, real estate, redevelopment, the economy on April 2, 2012 by Mary Vogel. What Do You Recommend for Unemployed Planners, Mayor Adams? Thanks for your mention today in State of the Cityat City Club our statewide land use planning legacy and such efforts as Portland’s complete neighborhoods. These efforts have attracted planners and other built environment professionals from all over the country (often right out of graduate school).Yet, for much of the time that I’ve been back here (mid 2007), the City and related agencies have been laying off planners and shrinking their RFPs. The unemployment rate amongst us built environment professionals is said to be around 45% (though things seem to have picked up a bit for some architecture firms lately).What do you recommend for those of us in planning and other built environment fields? It seems your jobs plan overlooks us. Should we seek to squeeze into other fields? Move to another city? Try to get a job with New Seasons? Start our own B-Line bicycle delivery company? Other?I’m going to post this question on my blog and tweet it to you as that will have far better chance of getting an answer. MaryPS I’d like to suggest that your next round of budget cuts start with the POLICE! The number of police and amount of overtime you/they spent on Occupy Portland has been quite wasteful. Please know that it is me and people like me who are part of Occupy Portland! We will take care of the occasional overly enthusiastic person in the group ourselves. We don’t need three trucks of cops fully-equipped in riot gear riding around our downtown streets to make us feel safe–not to mention all the police car, bicycle and horseback cops et al–quite the contrary!PPS I appreciated your response to the Oregonian’s article on street maintenance. Bob Stacey just posted a fine piece about that on his blog. This entry was posted in Economic Development, Land Use Planning, Portland Plan, Unemployment in Built Environment Professions, Urban Growth Boundary on March 2, 2012 by Mary Vogel.